The Dell Premium Active Pen features flexible, multi-protocol compatibility with select Dell 2-in-1s with a Windows Ink compatible display. 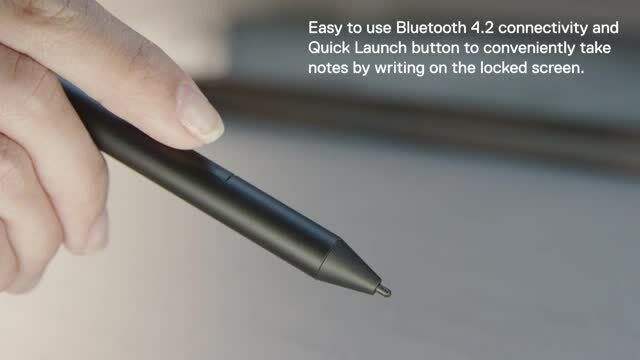 The pen’s multi-mode controller can be used across all protocol platforms—MPP 1.51 (Microsoft Pen Protocol), Wacom AES 1.0 and the latest Wacom AES 2.0 technology. Quickly launch OneNote by clicking the top button and write notes (even on a locked screen), capture a screenshot, or activate Cortana. Efficiently erase or launch the context menu with the side buttons. Install Windows Ink Workspace to customize buttons to your needs. The Dell Premium Active Pen is the first active pen that offers multi-protocol compatibility including AES 2.0i. Create strokes of varying lightness or darkness, with low lag, and detailed shading thanks to AES 2.0’s 4096 levels of pressure sensitivity, 240Hz report rate and tilt support on Dell 2-in-1 notebooks with Wacom AES 2.0 technology. Rest your palm comfortably on the screen when you work and you’ll be safe from potential errors thanks to palm rejection technology. The magnetic pen securely attaches to the side of your 2-in-1 on supported Dell 2-in-1 notebooks, or you can use the included pen lanyard to tether it to your 2-in-1 on supported Dell 2-in-1 notebooks. Get started right away with easy to use Bluetooth 4.2 connectivity and be worry-free with a 12-month battery lifei and 1 year limited hardware warranty.